A trauma doesn’t only happen to one person – it happens to everyone around them. Megan Smith-Morin began recalling the day that her and her husband-to-be’s life would take a sharp unexpected turn. Her husband, Mathieu had suffered a work accident, falling from 35 feet high above the ground. “The day I got the call was on May 1, 2014. I was at work; I remember specifically the patients that I was seeing. Human resources from my then-fiancé’s work called me and they told me that Mathieu had a major accident and that I had to come to the Montreal General Hospital,” explained Megan Smith-Morin, Occupational Therapist at the Montreal Children’s Hospital. Mathieu suffered a polytrauma. He had a traumatic brain injury along with multiple fractures that required services from the Trauma team, Neurosurgery, Orthopedics, Plastic Surgery, Ophthalmology, Nephrology along with allied health services such as Occupational Therapy, Physiotherapy and Social Work. He had multiple surgeries to correct his fractures to his body and his face. He was admitted to the ICU for 3 weeks and then was transferred to the 12th floor where he was admitted for one month. Mathieu does not recall the accident. 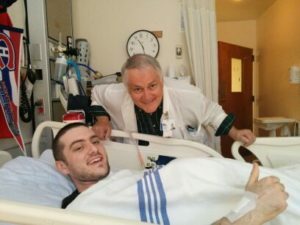 His first memory after the accident was his birthday celebration on June 5, as multiple friends, family and MGH staff made sure that his birthday was well celebrated. He remembers waking up in the Hospital, feeling confused and unaware of his surroundings. “This kind of accident never leaves you. On a daily basis, you always think of what you’ve been through. The hospital staff gives you the world – that’s their job but yet they do it with such dedication – and as patients you always remember them,” expressed a teary-eyed Megan. And with every downpour, must come a ray of sunshine. 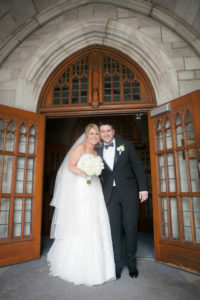 On July 4th, 2015, over a year after Mathieu’s accident, he and Megan wed at the Birks Chapel of the McGill Faculty Club. This day remains a very special day to the couple for several reasons. “It still is quite difficult for everyone. On our wedding day, there were a lot of people crying because it was such a happy and rewarding moment to celebrate all that Mathieu had accomplished in one year” recalled the bride. Despite moving forward with their lives, the Level 1 Trauma Centre at the Montreal General Hospital has stayed at the forefront of their minds. “The staff at the MGH do so much – you wonder what can we do for them? We said, ‘Why don’t we make a donation to the General through the wedding?’ We were very happy that we were able to help out in our own way to support the Dr. David S. Mulder Trauma Centre,” said Megan. In April 2016, Megan and Mathieu welcomed their first born child, Beatrice – a beautiful, healthy and happy little girl who remains a daily reminder of how far they’ve come.